Spot your shots easily. "Intense" white splatter offers superior downrange contrast. 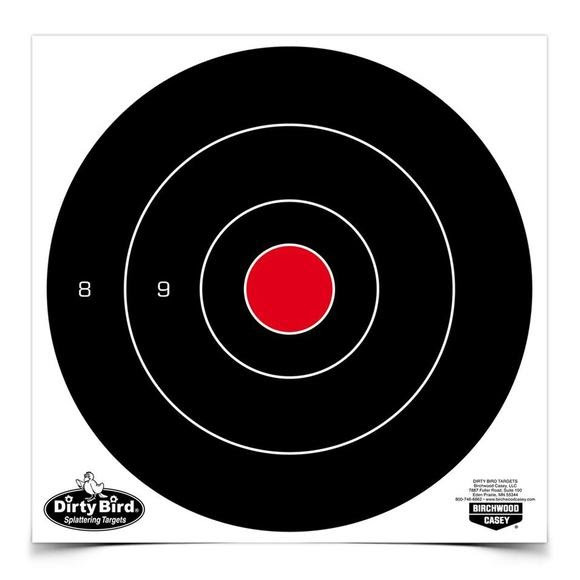 The large size Dirty Bird® 8" Bull's-Eye Targets are great for longer range shooting. Great for short or long range shooting. Heavy tagboard construction. The non-adhesive back also allows you to affix to a surface as you wish, add notes and then easily save the targets for future reference. Spot your shots easily. "Intense" white splatter offers superior downrange contrast. The large size Dirty Bird® 8" Bull&apos;s-Eye Targets are great for longer range shooting. Great for short or long range shooting. Heavy tagboard construction. The non-adhesive back also allows you to affix to a surface as you wish, add notes and then easily save the targets for future reference. Great for indoor or outdoor use.